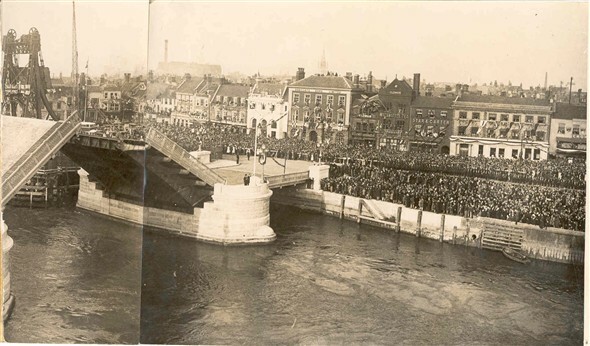 Local people crowded onto the quaysides and even the rooftops of near by buildings to witness the opening of the Haven Bridge by HRH Prince of Wales on 21st October 1930. 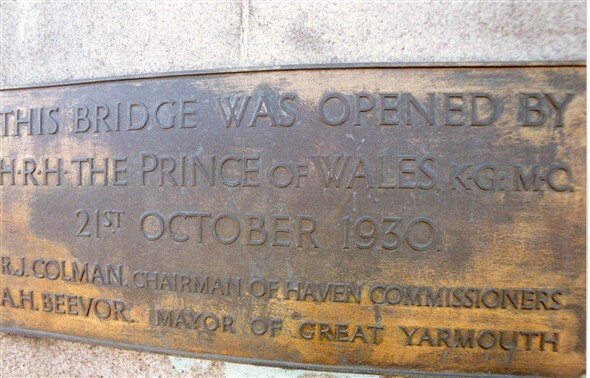 A plaque commemorating the event can still be seen on the bridge today. I was present at the opening of the new Haven Bridge,we were taken, the whole class from Rampart Road School and given paper flags to wave. I was five years old. I was three months old when the bridge was opened and my mother told me that she took me in the pram to watch the opening and she was near to the front. I do not know if we were on the Yarmouth side or Gorleston. Mind you,my mother lived in the Gorleston high Street so possibly we were on the Gorleston side. I was present on the Yarmouth side of the bridge and lined up with the Priory School aged 7 years. My Mum, Rose Lark, told me as a child that she held one end of the ribbon. She would have been 12 at the time and was in a children's home on North Quay. She has just passed away at the age of 91and I am trying to find out some details of her childhood. My father worked with compressed air putting the footings down on this bridge. My Dad, Kenneth Magnus worked for Chadwicks the photographers in Great Yarmouth & took official photos of the bridge & the working machinery in 1930, I've never seen them, but would like to, anybody any ideas? Re Frank's 2007 post, the drawings are in GT Yarmouth Library.The mechanism incorporates a geared arc at the bottom of the leaves which allows the leaves to retract into the piers. I believe that the original motors are still in use. I worked on this bridge for a number of years and left to work on the new Breydon Bridge in 1995. When I left the Haven Bridge most of the mechanism for raising and lowering of this bridge were original and looked like a museum. Trevor Magnus is correct. 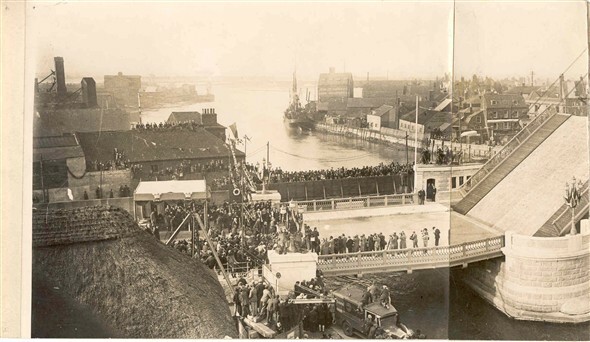 The British Photographic Corporation took the official photos of the construction of the bridge. One of the directors of BPC was Cyril Chadwick. A print of the exterior of the bridge came up for sale on a well known Internet auction site recently. My dad also worked on the construction of this bridge. When we were children he showed us the rivets he put in, which I imagine are still in place today? He's probably also in these pictures (somewhere! ).